Protesters at City Hall on March 20, 2019, in New York. Guided by a coalition of 40 New York City social justice organizations, dozens of students, parents and advocates converged on New York’s City Hall Wednesday to protest Mayor Bill de Blasio’s proposed increase to the NYPD’s School Safety Division budget, saying those millions would be better used on student social supports and services. In an attempt to stem the tide of the school-to-prison pipeline, the Dignity in Schools Campaign-NY brought together a team outfitted in bright green “Counselors Not Cops” T-shirts in opposition to de Blasio’s 2020 fiscal year preliminary budget, which increases the NYPD’s School Safety Division by more than $27 million, bringing its total budget to at least $314 million and perhaps as high as $431 million—the largest proposed budget for the division in its history. Additionally, the School Construction Authority is proposing to double school security spending to reach $200 million for policing instruments such as video surveillance and metal detection equipment, which, for many, is simply more fuel for the school to prison pipeline. 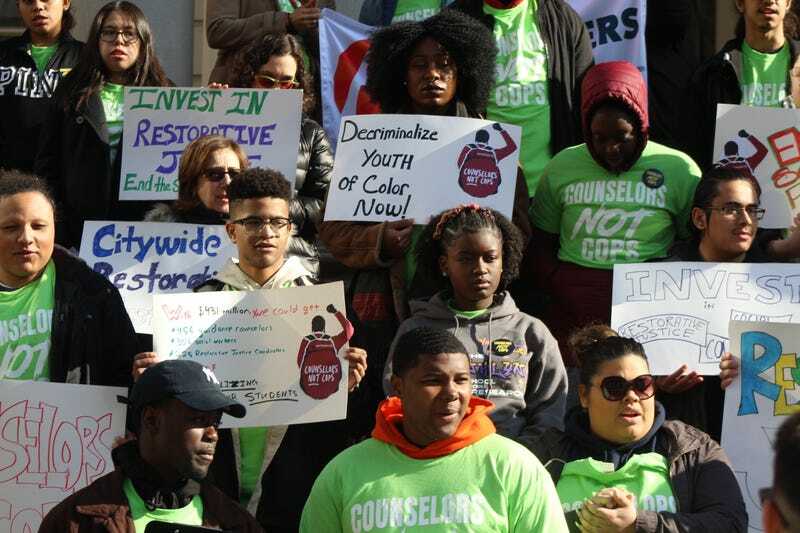 What these advocates and their supporters want instead are funds funneled towards restorative justice practices in schools, and more guidance counselors and social workers. The mayor’s office sees it differently. Olivia Lapeyrolerie, Deputy Press Secretary for Mayor de Blasio, sent a short email response to The Root’s questions about the increase in funds. “This is not new money nor does it increase the budget. [It was] part of a collective bargaining agreement, and was transferred from City labor reserve,” the statement read. Restorative justice, says McDonough, funnels money into helping students and their families and tries to get to the root of the issue when kids act out in school, instead of automatically suspending or jailing them. McDonough says that so far, the mayor’s proposed budget shows no increase in restorative justice areas, even though that has been shown to work, whereas more police in schools have proven to be ineffective. More police (or police products) in schools hasn’t worked, especially for students of color who are already over-policed, criminalized and jailed at higher rates than their peers. And in New York City, data backs this up. Last April, the NYCLU released a report showing that Black and Latino children are still disproportionately arrested, handcuffed, and issued summonses by police in their schools. Moreover, though they make up about two-thirds of New York’s student body, black and Latino students continue to represent approximately 90 percent of arrests and summonses there. The NYCLU concedes in its report that under Mayor de Blasio, the School Safety Division has made a serious effort to address the overuse of police tactics in school discipline, citing a dramatic drop in the use of summonses, from 1,275 in 2012 to 18 in 2017.